This project is a great example of a well designed house situated on a heavily sloped, narrow lot, located just outside of Haddonfield, New Jersey. We were asked to design a new home for the owner of a high end kitchen cabinet showroom, where she can display a wonderful example of their kitchen line in a home setting. We were asked to design the house with as few stairs as possible, a difficult task given the circumstances of the land. The design of the house was to include a garage for two cars, an attractive mudroom entrance, a main entrance foyer with arched openings to a dining room with fireplace on one side and a library/study with an additional fireplace on the other. The foyer leads to the back of the house where the home is very open, and includes a fabulous kitchen that is full of light, open to the great room and breakfast room areas. 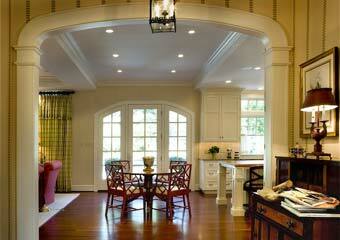 A butler pantry is situated between the kitchen and dining room. The entire rear wall includes French doors that open to a bluestone patio area. 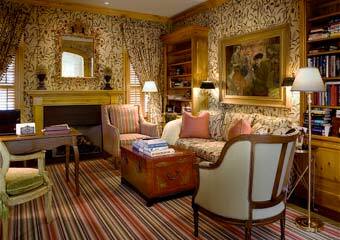 The entire house is well appointed with fine furniture, wallpaper and finishes throughout. A few steps up above the garage is a master bedroom suite with a cathedral ceiling, marble and tile bath, large shower, and walk in closets with custom designed built ins. The master bedroom is lovely, and has windows facing each side with the walk in closet blocking traffic noises from the front of the house. 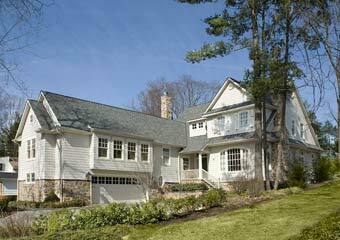 A second floor includes three additional finished bedrooms and two baths. 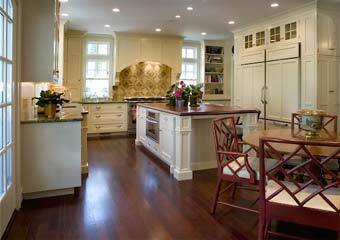 The house was constructed by Legnola Builders of Haddonfield.